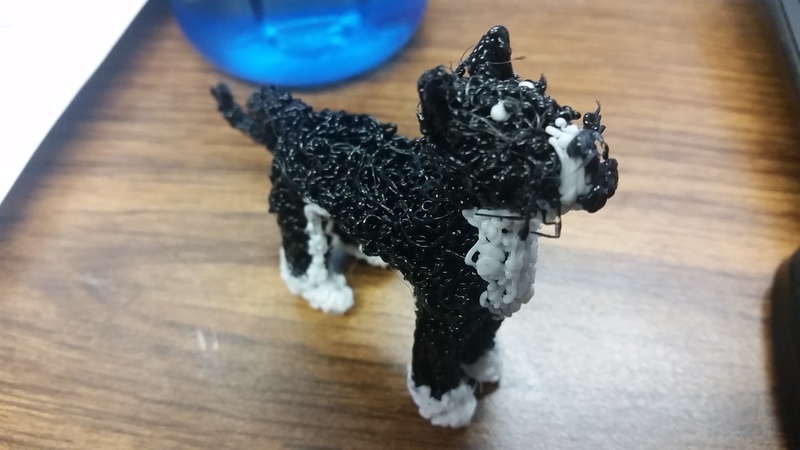 When I first looked into getting a 3D printing pen for my library, I heard a lot of mixed things. Common complaints were that it was difficult to make anything with 3D pens and that using them was painful for your hands. Although I can see where these complaints come from, on the whole, I have been very pleased with the Scribbler that I got. The specific pen I got is the Scribbler V3, which is sold for about $130. It comes in a variety of colors. In the box, you’ll find the pen itself, the power cord, and three small loops of filament in different colors. There is also a short sheet of instructions. I didn’t find it difficult at all to get started with the pen; it’s very plug-and-play. The button used for pushing the filament out of the pen is also the button used for loading filament into the pen. When the pen turns on, you simply set whether you are using PLA or ABS, set a temperature to warm it up to, load your filament, and start drawing. The pen has a small display screen to provide you with information such as its current temperature and speed. There are six extrusion speeds, so you can choose for the filament to come out faster or slower if you find that useful when you’re drawing. This was important to me; the 3Doodler, one of the most popular and well-known 3D printing pens, requires you to buy special plastic strands of filament to load into the pen. These can cost around $10 for a 25 pack. With the Scribbler, I can simply snip off some filament from the 1kg spools I use with my Makerbot, which I buy for around $23 each. I am not a big very fan of companies that force dependence on their own products, so Scribbler was much more appealing to me for this reason. (Especially as it leads to situations like what just happened with Cube 3D printers.) It’s also a handy way for me to use up the bits at the end of filament spools that are too small for a full print. I can see how this would vary from person to person. I think it might be more difficult for children to maintain the hand position for extended periods of time, but I am about five feet tall and do not have the largest hands, and I haven’t experienced much of an issue. It’s easy to stop and take a break when you need to. The pen cools down quickly as soon as you stop pushing the extrusion button; this is a mixed bag, since it’s safer this way, but can get a little irritating if you keep taking short breaks and then have to wait for the pen to warm back up. I think so, anyway! YMMV. The flip side to the above is that it requires a fair amount of patience. I don’t know how this compares with 3Doodler, as I’ve only used this pen, but I find the power cord to be a little on the short side, which is limiting as to where I can use the pen. I need to sit pretty close to an outlet or power strip, which I find inconvenient. If I could improve any one thing about the pen, it would be this. Requires a very specific technique to make anything. I really like this pen, and it didn’t take me very long to get the hang of it. That said, it’s not a great choice for everyone. It probably would not work well for children who are young enough that the amount of patience required would be a problem. It would also not work well for anyone who might struggle to hold the pen/hold down the button for an extended period of time, due to issues like the size of their hands, arthritis, joint pain, disabilities, etc. This pen is not going to help you create highly functional objects, like a 3D printer might, but it’s nice for creating artwork, and I think a lot can be said of its “cool factor”–it’s a good way to get people interested in 3D printing and to provide them with a relatively low barrier way to try out the concept. I haven’t tried this yet, but I also think it could be a neat way to add details to a regular 3D print. Normally, unless you have a dual extrusion printer, your prints are going to be all one color; the pen gives you a quicker and easier way to draw on small details in different colors. 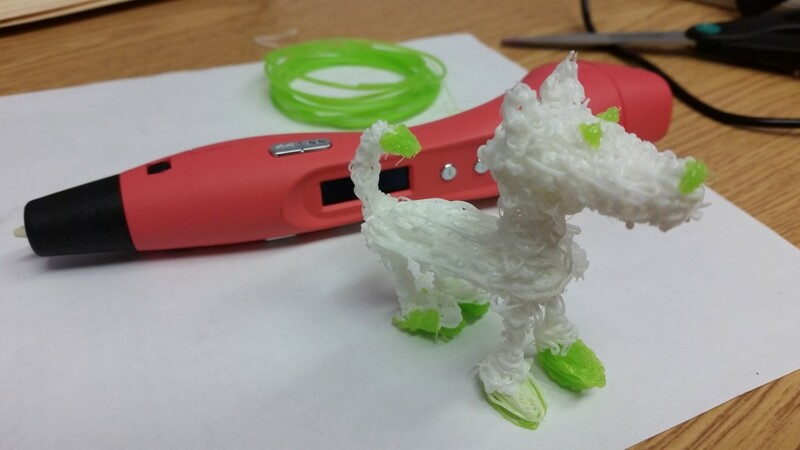 Have you used a Scribbler or any other 3D printing pen? What did you think of it? We’d love to hear your thoughts in the comments below, or on Twitter! 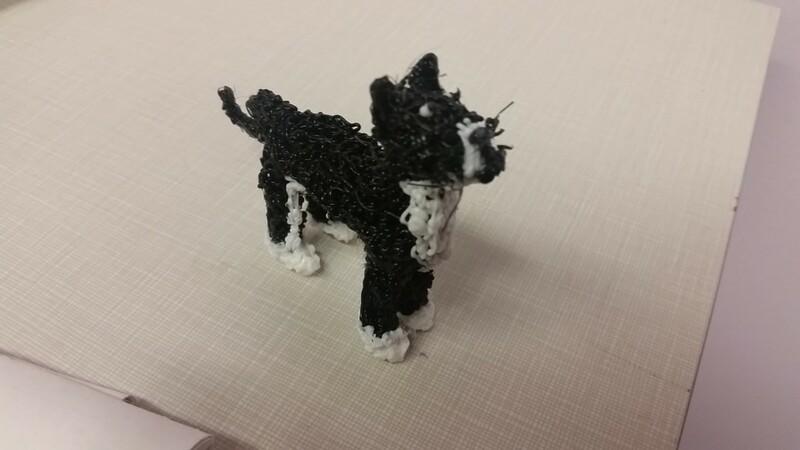 I am working on a project that depends, in part, on public access to 3D printers across the US. The directory/map you have published on your MakerBridge web site is very helpful. How up-to-date is it? What is the total number of institutions listed? I see you emailed, as well, so I will respond to you by email!